This is one of my favorite Maxi dresses. I love the pattern and that it has the sheer bottom. It is the perfect dress for summer. It can easily be dressed up or down. I am so excited because we are getting family pictures taken today! We haven't done this since Andi was a newborn. Since Andi will be 6 months old on the 4th of July we are also just going to do her 6 month pictures today! I got her the cutest little Birthday hat. I can't wait to share them! Lets hope we don't die from the heat while taking these today! I love that color and how unique it is as a backdrop to a floral pattern. 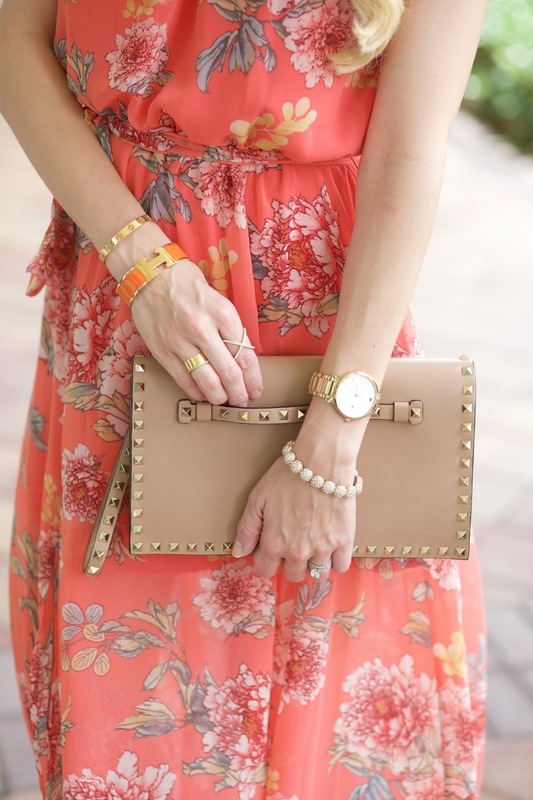 such a pretty dress and clutch! Love that dress! The coral color is gorgeous! What a great maxi dress. I love the colors and it looks like a versatile piece that can be dressed up or down. Love it! I always love your outfits! This dress is gorgeous! http://trendkeeper.me .. A classic blogger problem and COMFORT! This maxi dress is absolutely stunning! Love. You look stunning! Floral prints are amazing on you! I can't get enough maxi dresses for the summer. Stunning!!! Lovely dress, you look fab. Such a beautiful maxi dress, love the colour and floral print. This is such a pretty dress, I love the print and the one-shoulder detail! Beautiful dress. The color & movement is wonderful.